Ok, let me catch you up to speed... I don't know what it is about our cars lately but everytime I think about them I want to cry [I'm crying at everything lately, see post below] and that's why I haven't really mentioned them since the above mentioned post. For the last couple of months the Passat has been in and out of the shop, and we finally got it back last week. Did it cost a hefty penny? Yes. Does it work any better? No. So I've been cursing the thing for a couple months now, and haven't even driven it since we got it back. Well, that was until Tuesday, when I drove it to school and guess what happened... I lost the key, yup lost, as in the VW gods are mad at you for cursing their beloved Passat and now ye shall be punished for it, because it was yer only key, and now it's gone. They made it snow that day too! So we had this plan worked up to leave work a little early tomorrow and drive to the dealership to pick up the new key we had ordered. That is until my little brother was walking to his car up on campus, and happened to be looking at a bush and noticed a key on the ground...he picked it up and walked a little further over to where my poor abandoned Passat was and it worked. What are the chances?? i am such a spazz! i cant figure out how to extract and replace the files... i have the layout and everything i want already downloaded but when i right click on the files nothing comes up that says "extract and replace"! ugggh!...do you think you can help? That's a crazy story! i hate cars too...but can't live with 'em, can't live without 'em. Nooooo way?! He found the key?! That's awesome. When we went back that night we were going to look around some more but couldn't see anything in the dark. That lucky duck! I need to send him down to magic mountain and maybe he'll be able to find my key in the bushes too! Brilliant. P.s. 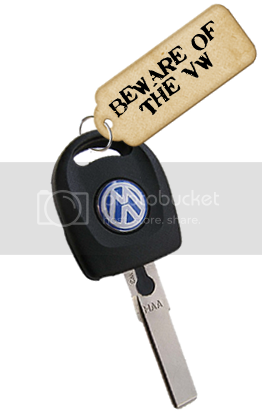 That picture of that dang VW key actually makes my stomach sink. And yes I know the VW Gods all too well myself. I am pretty sure if they would have let me search the tracks at Magic Mountain I WOULD have found that key to. But they wouldn't let me. Wow!!! That is so crazy!!! Glad you got it back...the vein in don's forehead was about o make it's appearance...haha! I love this post and couldn't help but comment! lol Glad you found it... honestly what are the chances. I can't believe your bro found the keys....LUCKY for you eh?! Love your blog!